Governance, Ethics, and Transparency Committee meetings are held in the Council Chamber at 9:00 a.m. on the Tuesday prior to the first and third Fridays of each month; however, the schedule is subject to change. Mayoral appointments requiring Council approval, including board and commission members and administrative heads of departments. Litigation matters, including appointment of special counsel, indemnification, and authorization of settlement. Issues relating to government ethics and transparency. With Council authorization, conduct investigations of: (i) the operation of any department or function of the County; and (ii) any subject over which the Council has legislative authority and upon which the Council may authorize. Amendments to the Charter and oversight of implementing amendments passed in the previous election. 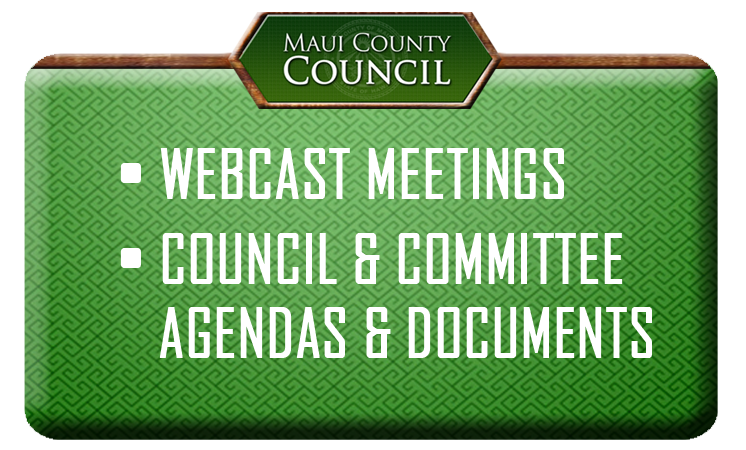 Intergovernmental issues, including the Hawaii State Association of Counties and non-financial intergovernmental agreements. Operations and performance audits of the Office of the Mayor (except the Office of Economic Development), Department of the Corporation Counsel, Department of Management, Office of Council Services, Office of the County Clerk, Department of Fire and Public Safety, Department of Liquor Control, Department of Personnel Services, Department of Police, and Department of the Prosecuting Attorney, including the operational oversight of any grants they administer. Implementation of the following General Plan objective: Strive for Good Governance.